How well do our celebs drive? Discovery Insure and #RidingPopGun creator and host Poppy Ntshongwana are teaming up with an eclectic group of well-loved, local celebrities to ride “Pop Gun” and answer this question by putting their driving skills to the test. With the festive season fast approaching, South African roads will soon carry thousands of holiday makers to their December holiday destinations. As the most dangerous time of year to be on South African roads, safety is top of mind. In a new 12-episode YouTube series called #RidingPopGun, Poppy will be carpooling with celebrities, in a vehicle fitted with Discovery Insure’s cutting-edge telematics technology to track the specifics of each driver’s behaviour. Celebs joining Poppy to sing and chat about road safety behind the wheel, include DJ Fresh, Boity, Locnville and Donavan Goliath, among others. Each will be ranked on a leader board weekly, to reveal the best overall celebrity driver. “I’m excited to see how #RidingPopGun can grow and how much fun we can have. It'll be interesting to see how well all the celebrities do in the driving challenge. It’s been a dream of mine to bring it to life. 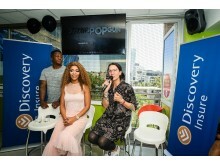 I’m excited that it’s happening with Discovery Insure on board,” said Poppy. But, can they sing? They don’t care! Hear Poppy and her drivers make sweet music between chatting about careers and life experiences, driving habits and, most importantly, reflections on how we can all make South Africa roads safer and reduce the holiday death toll due to motor vehicle accidents. People are inherently optimistic and believe they are good drivers. “Yet, our studies show that, when tested, only a minority really drive well and safely. We applaud Poppy and our local celebrities for shining much-needed light on the conversation around road safety. If all of us followed suit and paid attention to safer driving habits, the death toll on our roads - particularly over the holiday season - would be drastically reduced and our roads wouldn’t rank among the most dangerous in the world,” adds Swart. The first #RidingPopGun episode features Metro FM’s DJ Fresh sharing details of his life and career as well as one of the most important of the road safety lessons taught to him by his father – which he has passed down to his own children. Tune into https://www.youtube.com/user/POPPY5FM every Wednesday to watch your favourite celebrities take on Discovery Insure’s driving challenges as well as some behind-the-scenes footage.